Canada and the United States are now the centre of Bizarro World. This is where leaders promise to reduce carbon emissions but ensure a new, supersized oil pipeline called Keystone XL is built, guaranteeing further expansion of the Alberta tar sands that produce the world’s most carbon-laden oil. “It’s imperative that we move quickly to alternate forms of energy – and that we leave the tar sands in the ground,” the U.S.’s leading climate scientists urged President Barack Obama in an open letter Aug. 3. 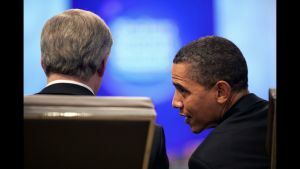 President Obama and Prime Minister Stephen Harper (left) say they’re worried about climate change, but neither the U.S. nor Canada has cut emissions.